Well Andy, life can be a real pain some times. Presently sat in the hotel without a moto as the engine died at the beginning of yesterday's ride and is now in a garage in Santander waiting to be fixed. Not quite the last day but close enough. Will post some pictures when we are back home. Also had a few wet days but still managed some good riding and enjoyed some great views. That's a bummer Mike, hope it's an easy (and cheap) fix. Looks like a great trip, apart from the belt problem how did you find the sportster on those roads? Also how was getting registered did you have any hassle? I was looking at buying one last year from the uk and having it shipped over, but whilst looking for one there was a Guzzi 1100 California in the next village and went for that. reg was no problem,,,,,, unless you count paying HD £180 for a CoC as a problem,,,,,,,,,,,,, (I've imported 3 Harleys and not had any bother with any of them). But given the crap exchange rates we've "enjoyed" since Brexshite, you may well find you could buy one here for a similar ammount and save yourself the hassle? The Sportster is my 6th Harley in 30 years, the other 5 were 2 1340 Evos and 3 1450 twin cams. Been thinking of switching to a Sportster for a while now as my missus rides pillion less than she did and the big Harleys were getting a bit heavy for chucking around twisty roads. What put me off buying one was that I'm 5'11" and have quite long legs so I though that the bike would physically be too small to be comfy. As one "friend" put it,,,,,,, "the Sportster is like a Harley but 7/8th scale,,,,,,,,,,,,,,,,, it's a pity you're not". But no worries, I have the 1200 Custom so the pegs are set forward a bit, very comfy. I should say it also has Harley's touring seat, plus an air hawk for long trips, and I've fitted rear air shocks from a Road King. With that combo, 350+ mile days are no problem at all, even 3 or 4 days running. Only other thing you should probably be aware of (if you're not already) is that the Sportster engine got rubber mounts in 2004, so I wouldn't fancy one older than that for long distance runs,,,,,,,,,,,, and they switched to EFI in 2007, so if you prefer a carb (as I do) then 2006 is the cut off date. Thanks for that, yes a rubber mounted engine and carb model is what I was after not really seen any here at a fair price! But as you say a poor exchange rate a coc and delivery here, plus if I got one from the uk it would be purchased unseen! I don't do a big mileage on a bike now and tend to use D roads where possible so maybe a 883 would suffice? 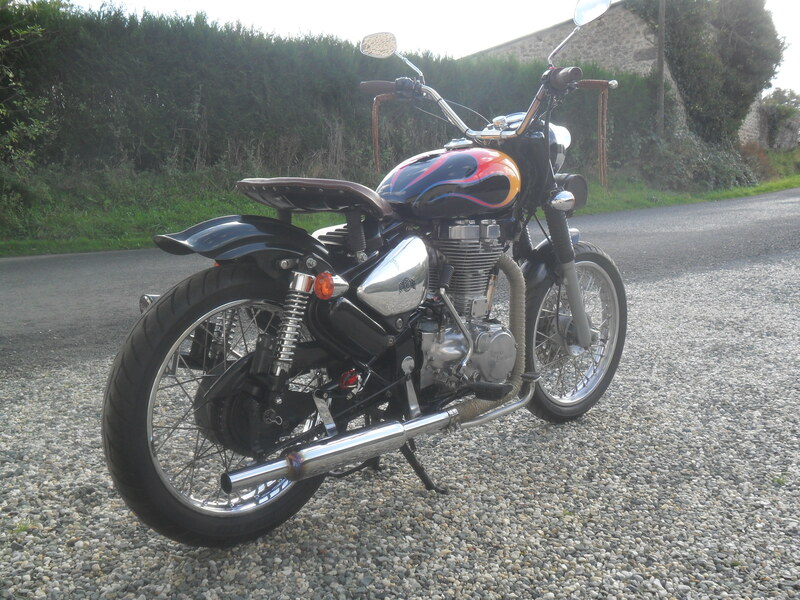 The other bike I fancy is again like a Harley something I have always wanted and never ridden, a royal enfield (Indian) I have a brit classic at the moment which I don't do much mileage on at all. Rather like the idea of an electric leg! Seem to hear very mixed reports about the Enfield though. Am I correct in thinking you had/have one? I tend to only ride it if I'm going out for a potter round the lanes on my own, my mate's bikes are all too quick for the Enfield to keep up. It's kind of for sale if you're interested, not desperate to sell but I have 4 other bikes and like I said, I don't ride it much. But the 1200 is quite high geared, it doesn't really want to be in 5th gear much below 60mph (the up side of that is 60mpg) so maybe an 883 would be better on smaller roads? Definitely need a test ride to be sure I think?